If you are searching for that perfect new or used car in Olympia, WA, search no more. Visit the Olympia Auto Mall, the largest Auto Mall in Washington state, with the most extensive inventory of new and used cars, trucks, vans, and SUVs. Whether you're looking for a certain make of new or used car or simply searching for the best vehicle in your price range, the Olympia Auto Mall offers the largest source of vehicles and the most competitive pricing. capital building to the stunning views of south Puget Sound and Mount Rainier. Whether you live in the capital or in one of its lovely neighboring counties (Thurston, Pierce, Lewis, Mason and Grays Harbor), take the time to appreciate the history and culture in your new or used car from the Olympia Auto Mall. Our friendly and knowledgeable staff offers expert guidance on choosing the right vehicle for your family or personal needs. From front wheel drive to 4-wheel drive and hybrid, including great trucks and SUVs to pull your boat or RV, we have every make of vehicle in exciting colors and sporty package options. Not only does the Olympia Auto Mall offer new and pre-owned vehicles, but we continue to care for your car long after it leaves the lot. We help you maintain your car or truck according to manufacturer's recommendations, offer excellent repair services, as well as parts and accessories. ...and by far, the best selection of new and used cars Olympia, WA has to offer. Make the Olympia Auto Mall your one stop shopping for all your automotive needs and drive away with the best deal on a new or used car today! Our Washington state Auto Mall is proud to be serving Olympia, Tacoma, Puyallup, Shelton, Chehalis, Lacey and surrounding areas. Our automotive dealerships provide foreign and domestic cars, SUVs, crossovers, sedans, coupes, minivans, and sports sars. We have recently added Awesome RV to our Auto Mall and proudly offer recreational vehicles of all sizes. Our dealerships offer new and used vehicles, service, parts, and accessories. 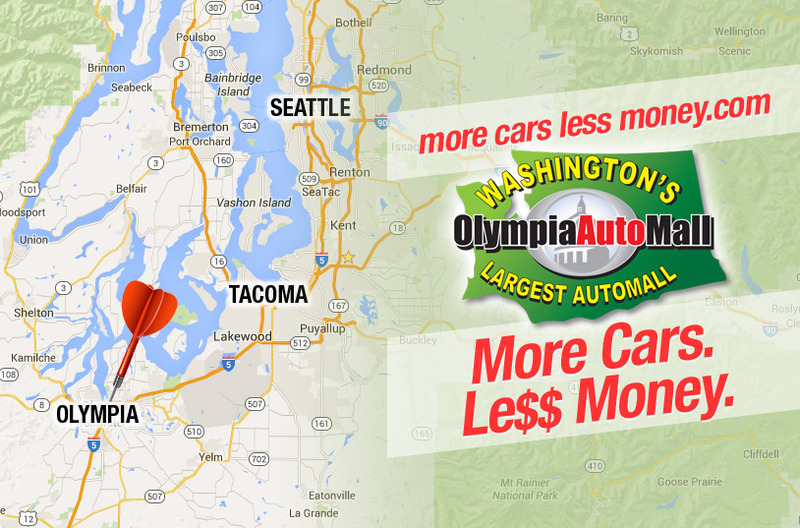 You can also find onsite financing making the Olympia Auto Mall a one stop source for everything automotive. The Olympia Auto Mall is South Sounds’ largest source of new and used cars, trucks, SUVs, and RVs. Browse our online inventory or get directions and visit us in person..